Two of our greatest educational theorists, John Dewey and Nel Noddings, have been reluctant to admit that some students are simply more talented than others. This was no doubt due to their feeling that such an admission was inconsistent with democratic concern for everyone. But there really is such a thing as superior talent; and the present book explains how that admission is compatible with our ideals of caring (and democracy). Traditionalists confident that some disciplines are more important than others haven’t worried that that way of putting things threatens to make those who are excluded feel quite bad about themselves. But an ethics of care can show us how to make these differences much less hurtful and more morally acceptable than anything that has been proposed by traditionalists. So the present book offers a middle way between the denial of the reality of superior talents and an insensitive insistence on that reality. 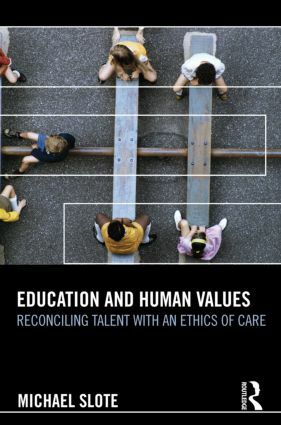 It argues that care ethics gives us a way to do this, and it bases that claim largely on the promise of such an ethics for moral education in schools and in homes. It is argued on psychological grounds that caring can only take place on the basis of empathy for others, and the book shows in great detail how empathy can be encouraged or develop in school and home contexts. Other approaches to moral education—like Kantian cognitive-developmentalism and Aristotelian character education—can’t account for (increasing) moral motivation in the way that an emphasis on the development of empathy allows. And in the end, it is only students educated via care ethics who will be sensitive to one another in a way that largely undercuts the negative psychological impact of educational institutions and practices that acknowledge the greater talents or creativity that some students have. Michael Slote is the UST Professor of Ethics at the University of Miami. He is a former Tanner Lecturer and a Member of the Royal Irish Academy. He has written many books and articles on ethics and political philosophy, most recently The Impossibility of Perfection: Aristotle, Feminism, and the Complexities of Ethics (Oxford, 2011).